by Precision Flight Controls, Inc. Many of our customers have found the benefits of this top-quality system, and now Premier is offering a substantial Spring Savings on simulator time. Schedule some time now to get yourself back to instrument proficient with our knowledgeable instructors. Why come to Premier to expand your training opportunities? There's a dedicated simulator area for distraction free training! That's right, you won't find our sim in the back of the classroom! We provide more than "simulator time". 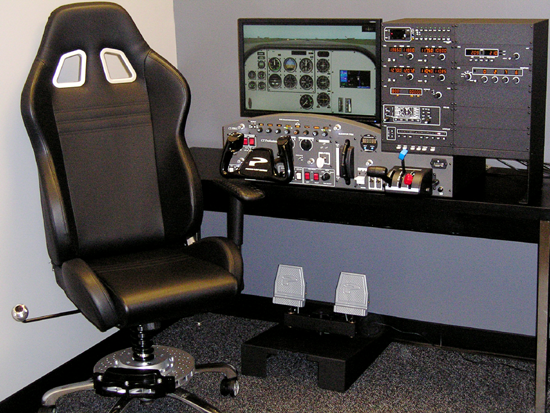 The FAA wants schools to provide more realistic, real-world training at all levels. Premier's highly experienced instructors will provide scenario based sim training. Our Sim is equipped with a Garmin 430 GPS! Experience a variety of realistically simulated system & instrument failures!